Ah, the season of conferences and trying to remember all the associated acronyms. It has been a blur of A+ sholarshipping, cheeky twitter backchannel exchanges, karaoke bars, and turning small-talk over mini sandwiches into D&Ms over pints. Over the past couple of months I have been incredibly privileged to participate in three fantastic conferences that I want to briefly note here. The 15th annual meeting of the Association of Internet Researchers was way too much fun to be considered work, but it was also productive and hugely energising. Thanks for putting it together, Erika Pearson. This was my second IR, after my first in Seattle back in 2011. It was the first outing for the new research I’ve been doing with Sian Lincoln on our Facebook Timelines study looking sustained Facebook use amongst twentysomethings. We’re using Facebook profiles/timelines as archives of experiences of transition to map how disclosure practices and growing up narratives change over time. The feedback was positive and supportive, which has encouraged me to push on with the project. We’re mostly through the pilot phase of the project now, so we’re going to get into some deeper analysis and get some writing out there before going back to build on the fieldwork. We also ‘launched’ our special issue of New Media & Society on ’10 Years of Facebook’ by putting together a little panel featuring three of the contributors to the special issue, and incidentally a few of my favourite scholars doing work on/around Facebook: Alice Marwick, Neha Kumar, and Ben Light. I also presented some of the Facebook Timelines work in another panel on ‘Privacy, Presence & Pseudonymity’ with a truly brilliant trio of scholars (and good mates): Tama Leaver, Emily van der Nagel and Sonja Vivienne. One of the stand-out memories from the conference was from day zero in the pre-conference selfies workshop. Facilitated by the fab Terri Senft, Alice Marwick, and Jill Walker Rettberg, drawing on material developed by the broader Selfies Research Network, the workshop focussed on how we might use selfies in teaching. The pedagogical focus is something often missing from the academic conferences I go to, so this was really refreshing (and helpful as I put together my plan for a new unit next semester on Digital Society!). Some of the selfies we put together in the workshop are over here. 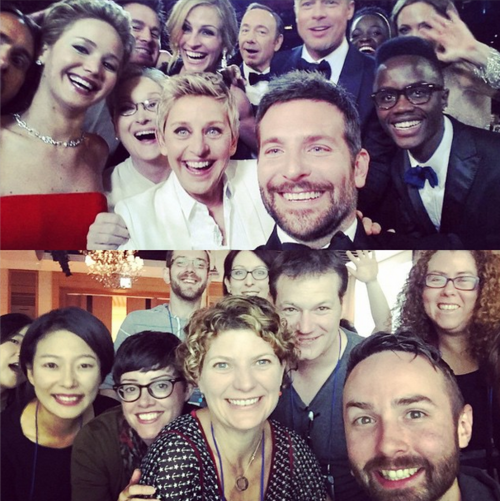 Here’s one of my favourites, where we re-enacted the famous Oscar selfie (for science). I also spent some time taking notes on how to subtweet people from the queen of subtwitter, Crystal Abidin. I’ve been going to TASA conferences since 2008, but this time it really felt like ‘home’. 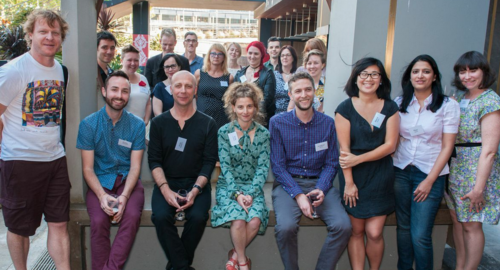 I was able to catch up with many of the sociologists I’ve built professional relationships with over the years, and hear about the latest in sociological research in Australia. The sociology of youth sessions continue to be vibrant and well-attended, programmed and driven by the very excellent Julia Coffey, Paula Geldens (who also recently emailed me a picture of her in a dragon onesie, so I love her even more), and David Farrugia. In addition to reporting on the Facebook Timelines project, I also teamed up with my PhD supervisor Andy Bennett to present a paper on some of my previous doctoral work into ‘vernacular subcultures’. This was in a panel with Airi-Alina Allaste and the always impressive Paul Hodkinson. 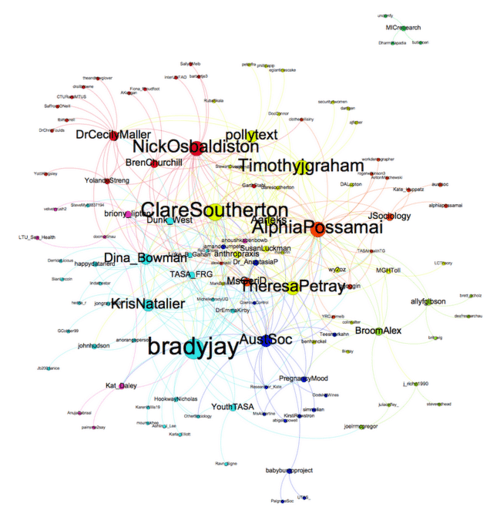 The conference backchannel was also quite active – sociologists are finally getting onto the tweeter bandwagon – and the very smart Tim Graham made this little network map for us. 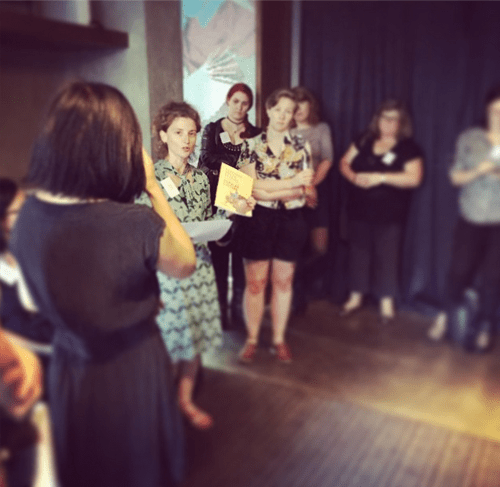 This is the first time this particular conference has been run – a topical, ’boutique’ conference as the first keynote described it – and I think it was a great success. Well done to the conference organisers: Catherine Strong, Anita Harris, Andy Bennett, Amy Dobson and Jonathan Smith. It covered a range of topics including political engagement, social media and gender, media literacies, subcultures and fandom, and digital identity. Stand-out sessions for me included keynotes by Paul Hodkinson on ‘bedrooms and beyond: privacy, identity and community in/between digital spaces’ and Sun Sun Lim, who spoke about the rise of mobile culture in parts of Asia. I was also very fortunate to be able to launch two books at this conference, amongst friends and colleagues. Thanks to Paul Hodkinson for launching Mediated Youth Cultures, co-edited with Andy Bennet, and thanks to Anita Harris for launching Teaching Youth Studies through Popular Culture, co-written with Sarah Baker. No more conferences for a while. I’m quite sick of the sound of my own voice now. Tagged conferences, sociologyBookmark the permalink.